Egypt’s long-rumoured second sphinx may have been unearthed by construction workers building a new road. According to local reports, a sphinx-like statue was found on Al-Kabbash Road, which connects the two temples of Karnak and Luxor built around 1400BC. Officials have confirmed the statue has a ‘lion’s body with a human head’. The ‘second sphinx’ has not yet been lifted from the ground, however, officials said tourists are welcome to visit the construction site to view the ancient statute. No photographs of the structure have been published, the Director General of Antiquities has confirmed. 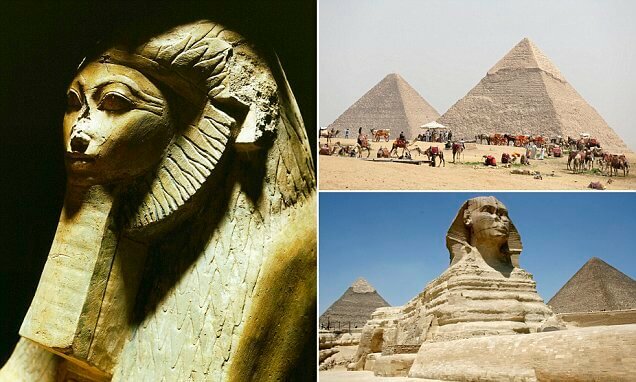 The Great Sphinx of Giza was discovered by the Great Pyramids on the west bank of the river Nile. It is the oldest and largest known monumental sculpture in the world. Excavations first started on the Karnak and Luxor temple complexes, located within the ancient city of Thebes, back in 1884, according to RT. This led to a flurry of significant archaeological discoveries until around 1960, when excavation work at the sites ceased. Construction workers uncovered the ‘second sphinx’ during a roadworks project between the temples of Karnak and Luxor. The Egyptian infrastructure project has been halted while the statue is examined. According to the area’s Director General of Antiquities, Mohamed Abdel Aziz, the statue can not yet be lifted ‘due to the nature of the environment it is in’. Aziz has confirmed tourists are able to visit the road to see the statue for themselves, however, he confirmed no images of the statue have been released. The Al-Kabbash Road project to excavate and restore the road first began in 2005 and is scheduled to be finished by the end of this year at a cost of $12.7 million (£10m). With the body of a lion and the head of a human, Great Sphinx of Giza measures a grand 239ft (73 metres) long and 65ft (20 metres) high. Literally translating to ‘Father of Dread,’ this mythical creature is believed to resemble Pharaoh Khafre, who was the ruler at the time of construction. It is believed that Djadefre, the elder brother of Khafra, built the Sphinx to honour his father Khufu. This would place the time of construction somewhere between 2550 BC and 2450 BC. However the limited evidence linking the Sphinx to Khafra is circumstantial and somewhat ambiguous. It was constructed around during the reign of Pharaoh Khafra, and it is thought that the face of the statue was modelled on his. Over time it gradually became buried up to its neck in sand, which helped to preserve it before it was finally excavated in 1925. It is just next to the Great Pyramid of Giza which was built as a tomb and a symbol of eternity for the Pharaoh Khufu. It stands 456ft (139 metres) high – just over nine double decker buses stacked on top of one another. WHAT IS THE VALLEY OF THE KINGS? The Valley of the Kings in upper Egypt is one of the country’s main tourist attractions, situated next to the Giza pyramid complex. The majority of the pharaohs of the 18th to 20th dynasties, who ruled from 1550 to 1069 BC, rested in the tombs which were cut into the local rock. The royal tombs are decorated with scenes from Egyptian mythology and give clues as to the beliefs and funerary rituals of the period. Almost all of the tombs were opened and looted centuries ago, but the sites still give an idea of the opulence and power of the Pharaohs. The most famous pharaoh at the site is Tutankhamen, whose tomb was discovered in 1922. These are among the most important funeral texts found on the walls of ancient Egyptian tombs.